Manchester City coach Manuel Estiarte has posted video footage on Instagram from inside the team bus as it arrived at Anfield before their 3-0 defeat by Liverpool in the Champions League quarter-final first leg. 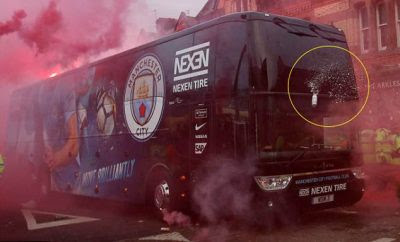 The bus was attacked by some fans throwing cans, bottles and flares. Liverpool have apologised and called the behaviour "completely unacceptable".